Majority of us thinks that most gifts made from crystals are expensive but we want to amend that idea. It’s true that not all that shines are diamonds, but crystals are gems that are comparable to diamonds except they are way cheaper. As a 15th wedding anniversary, crystals are symbolism of clear and glistening love between the couple and any crystal memento would be appropriate in any given occasion; however, the big question is, would it be worth it? 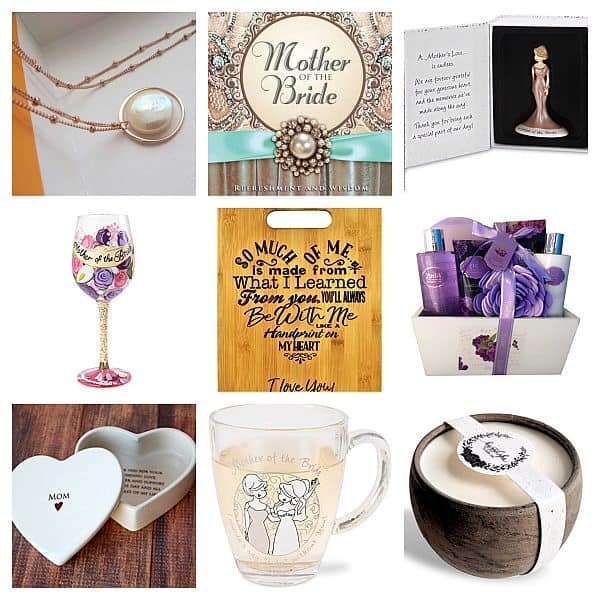 So whether you are looking for a stunning gift for a crystal anniversary, a fancy wedding gift, or a simple but classic birthday gift; we want to make sure that your present will be appreciated. 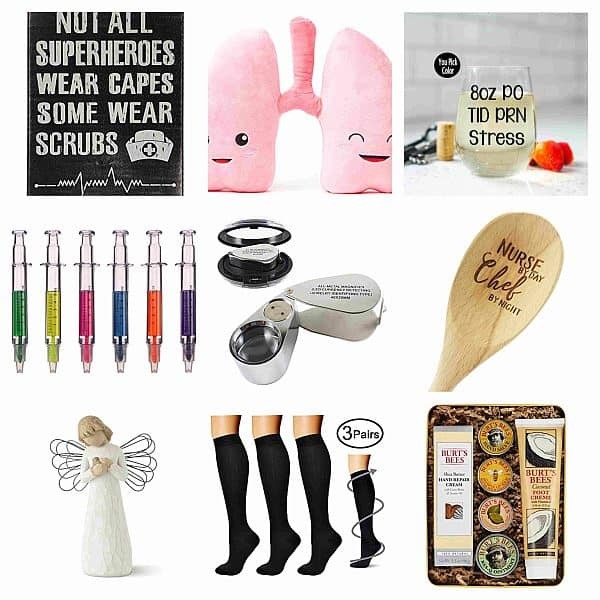 Because we believe in the power of giving and we want to be of help when it comes to gifting, we’ve summed up some gift suggestions for you to look at. So sit back and relax! 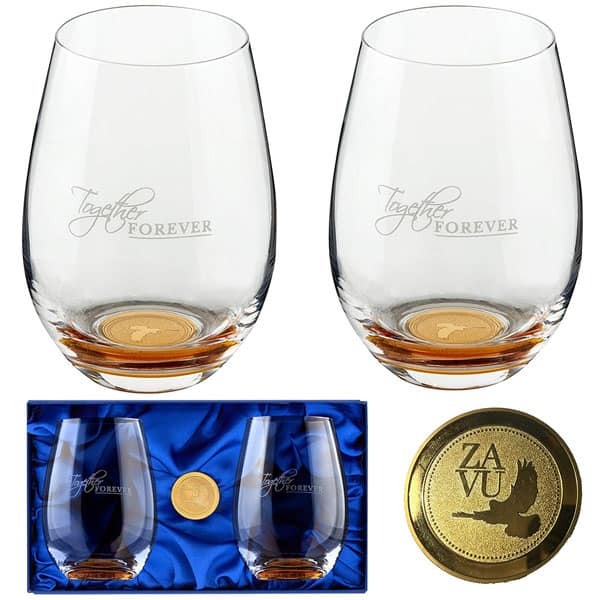 It really is a party of two with these stemless wine glass that were embedded with a coin and has high refractive index that gives a sparkling effect. This has to be the perfect gift that has an extra kick for any alcoholic or non-alcoholic drink. 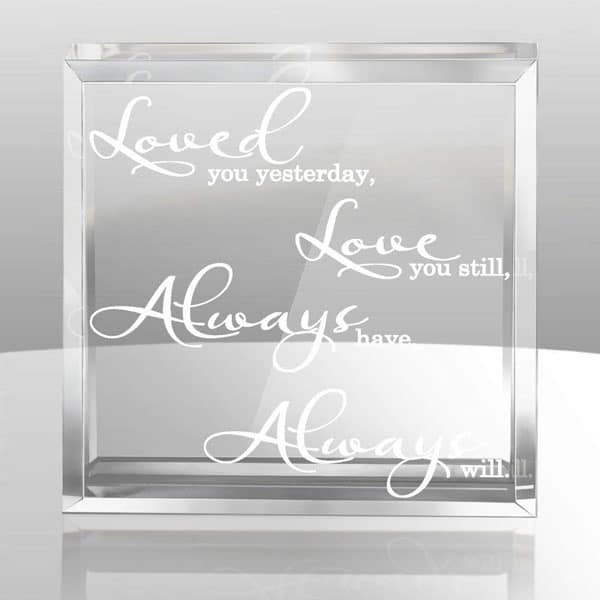 Engraved with a lovely poem that speaks about a love that will never ever fade, gifting this crystal paperweight to your family and friends will surely be appreciated. It is beautifully packaged in a glossy box, ready to be given as a gift. If a way to a man’s heart is thru his stomach, the way to a woman’s heart is thru a bouquet of flowers. But roses doesn’t last for a week, so you better give her something that may last longer and would be an elegant design to her table. This crystal paperweight is the impeccable gift for any occasion. 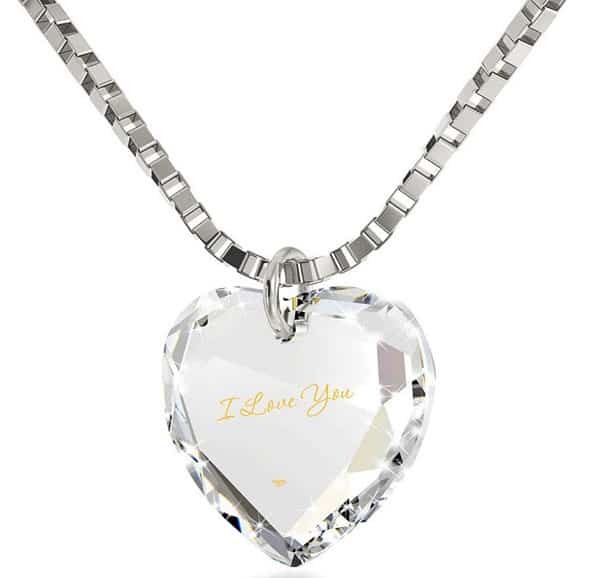 If you find it hard uttering the words, ‘I love you’ then let this chain necklace help you. With its crystal clear Swarovski pendant, you can be sure that your affection towards her will be evident. 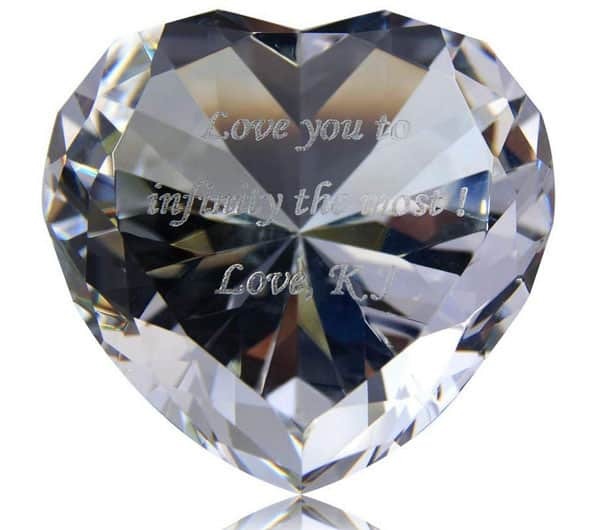 Nothing beats a gift that can be customized, it’s crystal clear that you have put a lot of effort and a personal touch. 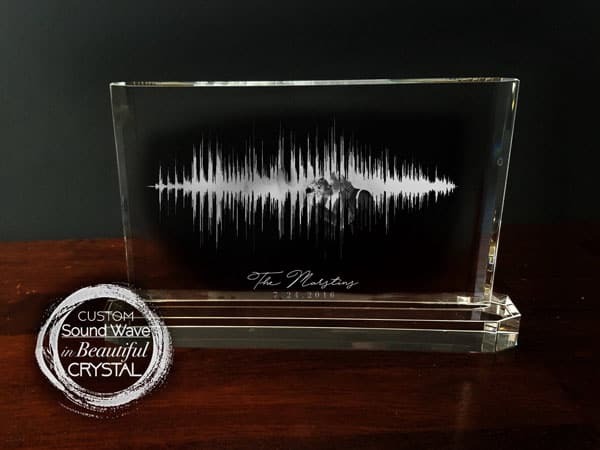 Well, speaking of crystal clear, we reckon the way to impress the receiver is by using a sound wave print within the crystal. You can thank us later! 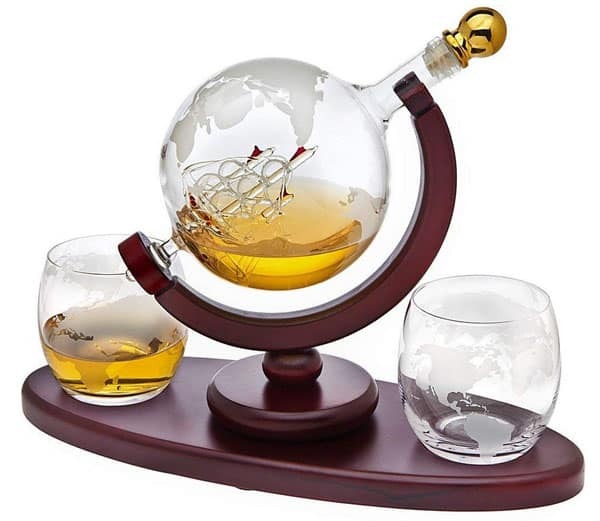 A great conversation starter at any party, this globe decanter whiskey dispenser will always be an eye-catcher. Even if the person is just a plain drinker and not a globe trotter, they’ll simply love the elegance that these crystal glasses cater! 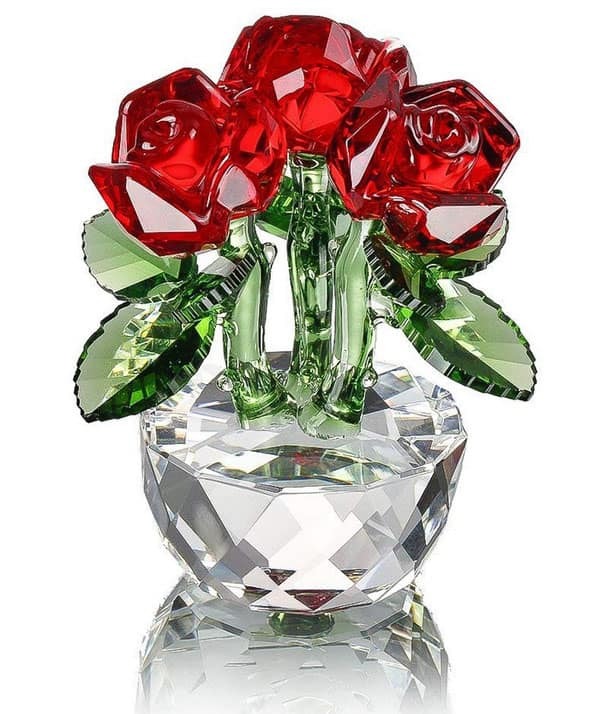 If you want to be extra romantic, allow this crystal rose to play music to the ears. 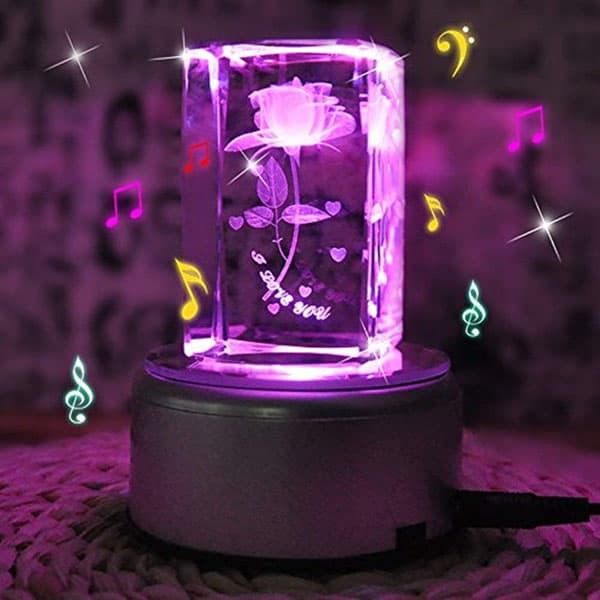 It comes with a built-in multicolor LED light under a bluetooth music base, anyone can be creative and passionate with it every time they switch the music. 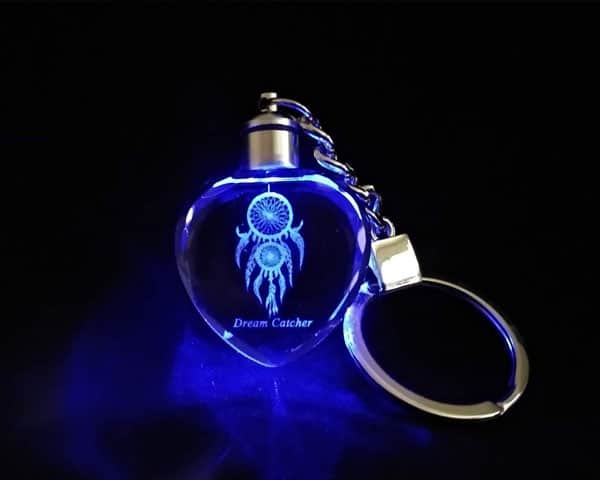 A dreamcatcher which can be kept inside a pocket. This type of keychain will certainly bring a sparkle to anyone’s day, with its LED light and crystal, it will never stop from shining (unless the battery needs changing). We thought that clocks are the most common presents because of its functionality and importance in the day to day activities, so if you are feeling fancy, then grab this crystal clock. 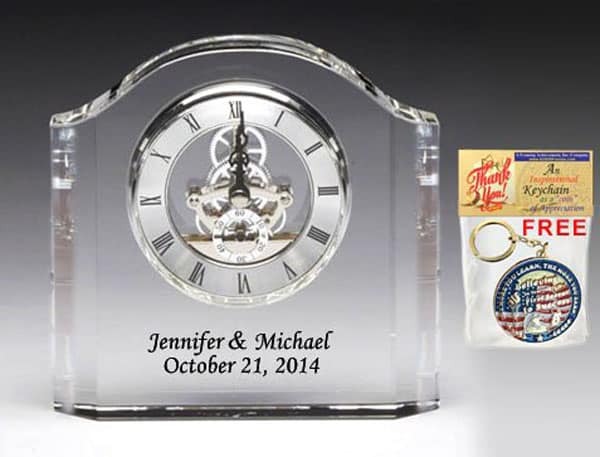 Not only does it work as a crystal desk clock but would also be an ideal wedding memorabilia. You know they say, ‘Diamonds are a girl’s best friend.’ So there’s no way she’ll never like this bling even as a paperweight or a table decor. Customize it with a touching message, and believe us that her heart will be glad about it. 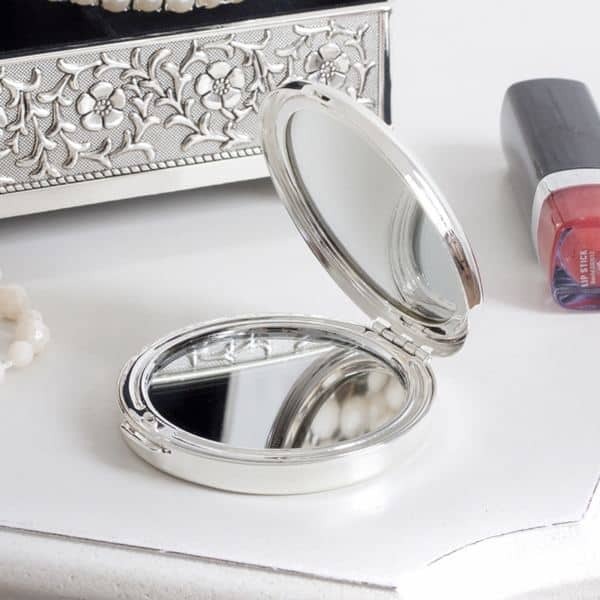 A stunning compact mirror that fits a woman who is always on-the-go, you can give it to her as is, or add a personal message at the bottom. So whenever she turns it over, she can never help but be happy with your engraved words of affection. Just because you choose crystal as a gift doesn’t mean it has to be expensive. This personalized pen proves that you can be fancy without having to splurge. Give it to your family, friends and colleagues for a shimmering item on their notepad or desk. 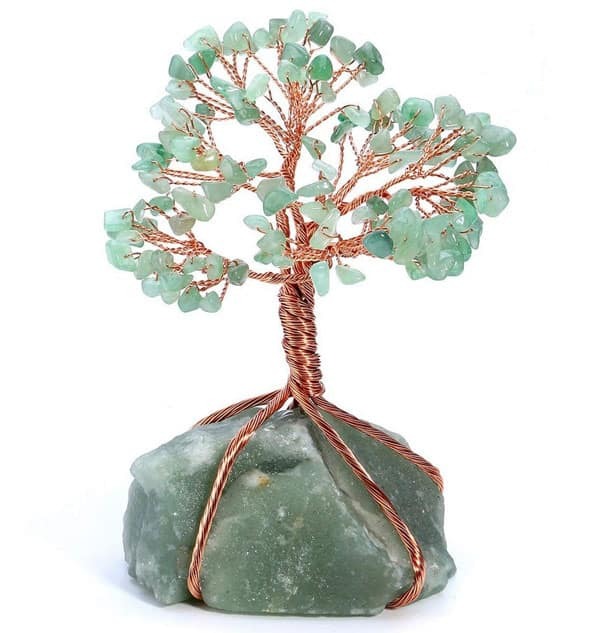 This unique Aventurine healing crystal is more than just a money tree, Feng Shui experts believe that the tree of life provides power and wisdom, making this a finest gift to wish the recipient good favors in life. It does not only bring healing to the physical well-being of a person, they say it also heals the mind and soul. 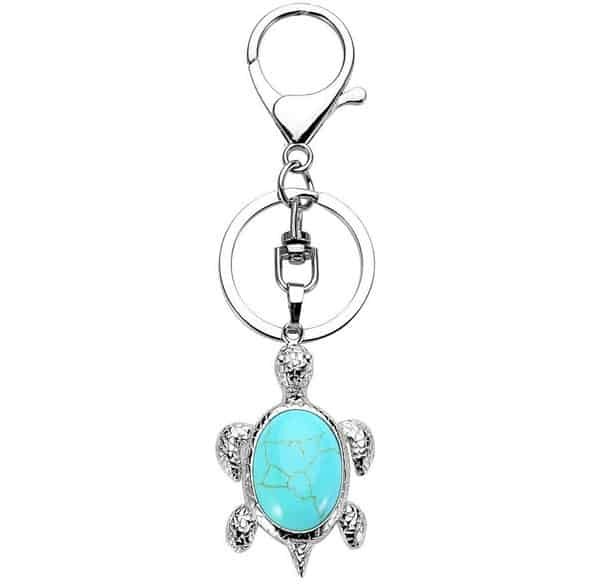 Made of alloy, lead and nickel free, this sea turtle keychain brings a lot of energy. The turquoise gem is a stone of self-forgiveness and acceptance, if you think that this keychain won’t impress the birthday celebrant, you should probably rethink that. 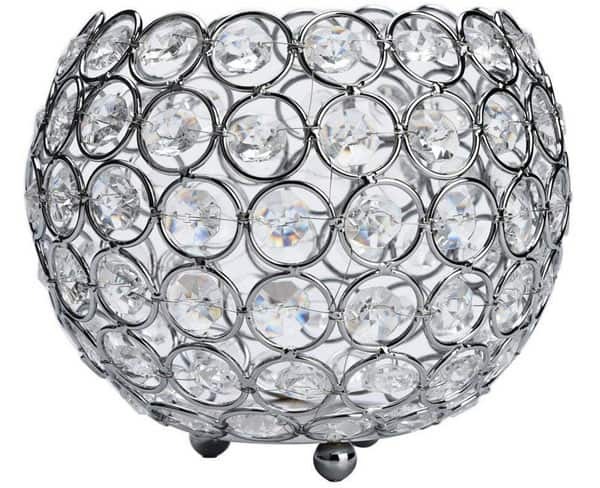 This crystal ball candle holder has been made meticulously to achieve its sophisticated design. There is no way the recipient would not love the glistening power it gives once a candle has been put inside it; alternatively they can use it as a flower vase. However they want to use it, one thing is certain, nothing can stop this crystal from being a stand out decor in one’s home. If there’s one item that caught our eyes, it’s got to be the Whiskey Decanter set, not that we are a huge whiskey drinker but we really appreciate vintage design; for the simple reason that they become an adornment at home from this day until the years to come. Yes, you may say that we are an old soul living in a modern world. We hope that you enjoyed our listing and that you also came to realize that crystal gifts don’t have to cost you an arm and a leg, it would always depend on how much you are willing to spend. 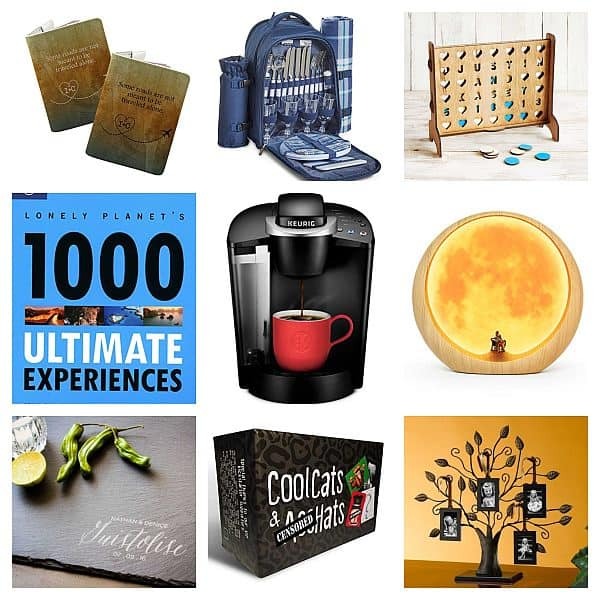 If you have other gift ideas that you want to exclaim, then tell us what you think on the comment space.